"The Rebellion is reborn today. The war is just beginning. And I will not be the last Jedi." 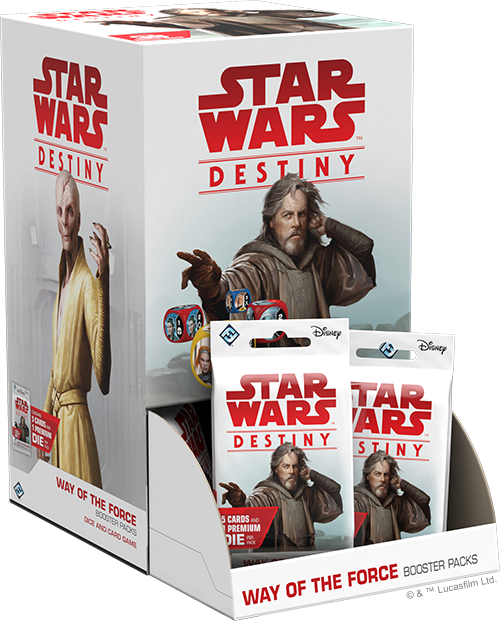 Order your own Way of the Force Boosters at your local retailer or online through our website today! Thirty years after the events of Return of the Jedi, a new battle between the light and the dark is emerging. This struggle is fought not just between Rey and Kylo Ren, but between the First Order, the Resistance, and their leaders. This battle is the center point of The Last Jedi, and now, this clash finds its way to your tabletop! 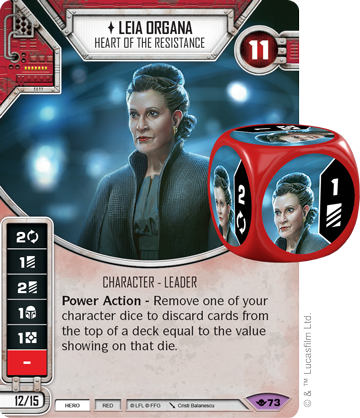 Join us today as we preview the characters of The Last Jedi found in Way of the Force, a new set of boosters for Star Wars™: Destiny! Way of the Force brings new twists to iconic characters of the Star Wars galaxy, many of which appear in the latest episode of the sequel trilogy. Look for new versions of Luke Skywalker and Leia Organa, as well characters entering Star Wars: Destiny for the first time, like Supreme Leader Snoke and the morally nebulous DJ! Leader of the First Order and master of Kylo Ren, there are few in the galaxy as terrifying as Supreme Leader Snoke (Way of the Force, 4). A servant of the dark side, Snoke takes pleasure in other’s pain, and his machinations have brought the Resistance to its knees. Snoke enters Star Wars: Destiny with little regard for his allies' well-being. In fact, he revels in their pain, using it to enhance their abilities through dark means. 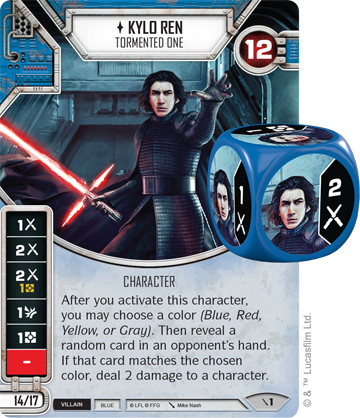 As a Power Action with Snoke, you may deal a damage to another one of your characters to resolve one of its character dice, increasing its value by two. 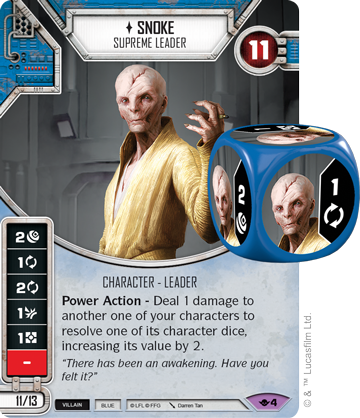 Snoke is a master manipulator, and with two focus sides, Snoke can ensure the dice he targets with his Power Action are optimally set. At eleven points for a normal version, or thirteen for an elite, Snoke might be the perfect fit to team up with an elite Kylo Ren, Tormented One (Two Player Set, 1). While Kylo Ren deals damage to your opponent with his powerful ability, Snoke can enhance his melee damage sides, putting serious pressure on your opponent. Of course, if Snoke doesn’t roll his focus symbols, there are more direct methods of manipulating your dice. 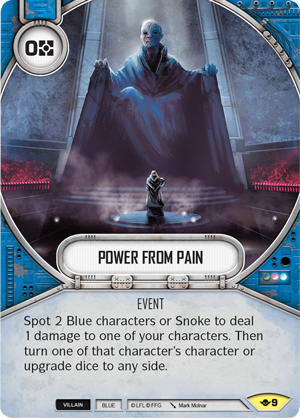 Power from Pain (Way of the Force, 9) allows you to spot two Blue characters or Snoke himself to deal one damage to one of your characters and turn one of their character or upgrade dice to any side. This can give you a perfect target for Snoke’s Power Action and help you find the true meaning of power. The drawback of using Snoke is that you may end up stacking damage on your own characters. Still, if your team embraces his tactics, it can be turned into a boon. 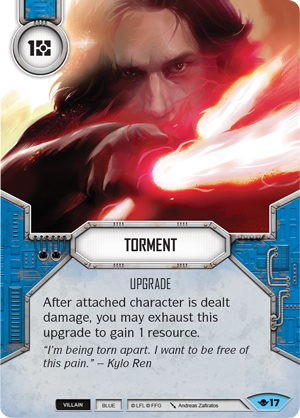 Torment (Way of the Force, 17) is a new upgrade that can be exhausted when the attached character is dealt one or more damage to gain one resource. When combined with Snoke, his Power Action will trigger a cascade of abilities that put you in position to decimate all who stand in your way. While dealing damage to your own characters can be a difficult decision, embracing the torment can lead to power from pain. Opposing Snoke and the First Order is a leader who motivates and lifts up those around her instead of tearing them down. A hero from a time long past, Leia Organa (Way of the Force, 73) now serves as the Heart of the Resistance. As a Power Action, you may remove one of your character dice to discard cards from the top of a deck equal to the value showing on that die. 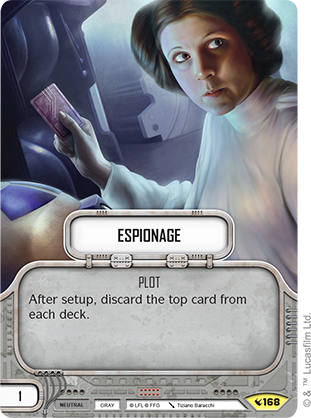 With two discard sides, Leia is an ideal candidate for the focus of a mill deck, defeating your opponent by forcing them to run out of cards. 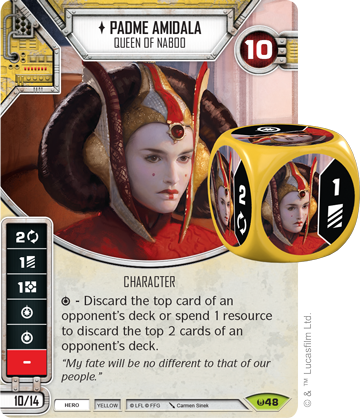 Leia can form a team with Padme Amidala (Awakenings, 48), forming the basis of a deck that will see your opponent quickly cycling through their cards. You can even run elite versions of both of them while adding an Espionage (Legacies, 168) plot to give you a head start! Unlike Snoke, Leia serves to push the Resistance forward with her inspiring presence, lifting up those around her through hope. 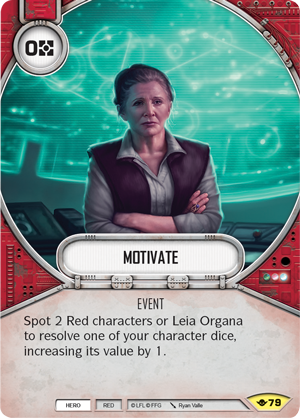 Motivate (Way of the Force, 79) is an event that lets you spot two Red characters or Leia to resolve one of your character dice, increasing its value by one—giving your heroes an extra boost to fight the First Order, gain resources for the future, or disrupt their opponent's plans. Her motivating presence encourages those around Leia to believe in her and the ideals of the Resistance, inspiring heroes to prevail not through pain, but through hope. While the war between the First Order and the Resistance is tearing the galaxy asunder, some don’t see the purpose in choosing sides. The only cause they believe in is their own, and whatever makes them a few credits or simply allows them to survive. DJ (Way of the Force, 35) is one such Treacherous Rogue, though he ultimately finds himself on the side of the Villains. DJ is an expert at getting out of a jam, no matter the cost to those around him. 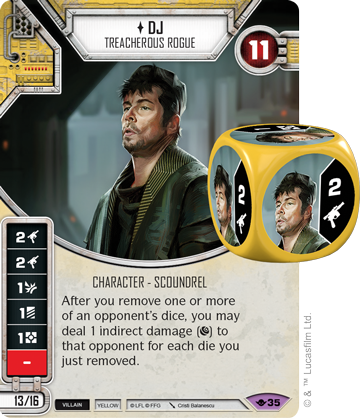 When this rogue is on your side, after you remove one or more of an opponent’s dice, you may deal one indirect damage to that opponent for each die you just removed. 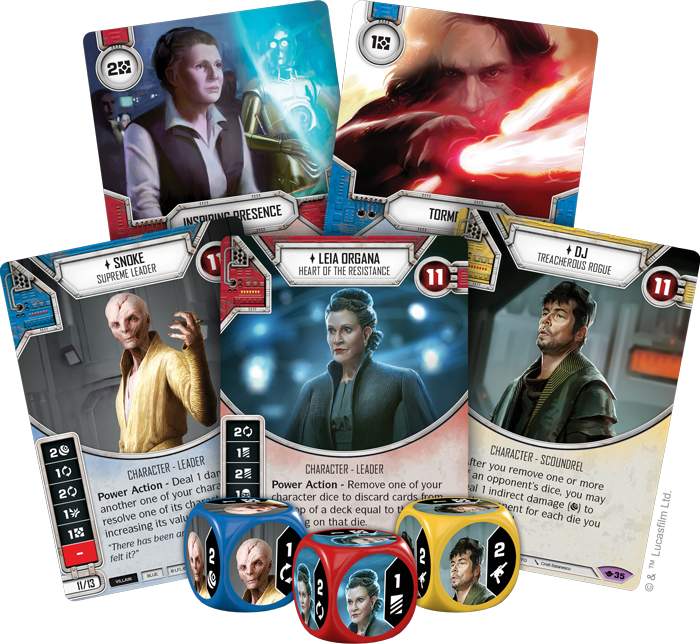 While there are plenty of cards in Star Wars: Destiny that remove dice and synergize with DJ, Way of the Force introduces several new tools to fill this role. In The Crosshairs (Way of the Force, 133) is an expensive, three-cost event, but it can be absolutely devastating if used by DJ. The evasive manuever lets you choose a symbol, then remove any number of dice showing that symbol. 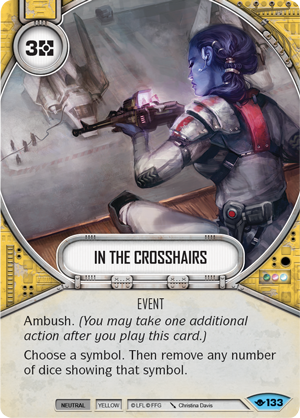 If your opponent is all lined up to deal a massive amount of damage as their next action, In the Crosshairs can help DJ make a quick escape by removing all of those dice and dealing some damage of his own on the way out. With the Ambush keyword, you even get one more action after turning the tables on your opponent. 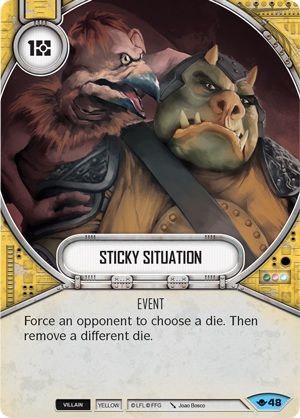 For a cheaper option, Sticky Situation (Way of the Force, 48) forces your opponent to choose a die. Then, you get to remove a different die. While you may not be able to remove the biggest threat on the field, you can still get rid of a dangerous die, and as DJ you can tag your opponent for indirect damage, further aggravating them. With two ranged damage sides, DJ is deadly in his own right, able to threaten your opponent with damage while avoiding harm. Good, bad, it doesn’t matter to DJ: his only concern is survival. Way of the Force introduces these characters and more to Star Wars: Destiny. Learn the ways of the Force with Luke Skywalker or give in to your pain and torment with Supreme Leader Snoke. Become a hero of the Resistance with Leia or look out for yourself with the Treacherous Rogue, DJ. What path will you take? Choose a side and pre-order Way of the Force (SWD12a) from your local retailer or our website today!